Besides being pleasurable, drinking tea may confer certain health benefits regarding cancer and heart disease. Serving a pot of English tea is also a way to socialize with friends. Tea first arrived in England in the 1600s and has become strongly associated with that country ever since. Many health benefits of tea are related to a class of chemical compounds called polyphenols. The polyphenols in tea are natural antioxidants that may help to prevent cancer, according to the National Cancer Institute. The University of Kentucky Cooperative Extension Service also notes that drinking tea may help to prevent cancers of the lung, colon, digestive system, kidney and bladder. However, both clinical and epidemiological studies investigating the association between tea consumption and cancer risk have not produced consistent results, notes the NCI. Variability in tea consumption and methods of preparation, as well as individual lifestyle and genetic differences may partly explain study inconsistencies. English tea contains caffeine, which may help to decrease your risk of Type 2 diabetes and more effectively manage the disease if it is already present, according to the North Dakota State University Extension Service. Caffeine helps your body metabolize glucose and control your blood sugar level. Tea also contains fluoride -- a mineral that helps to strengthen tooth enamel and increase the density of your bones. Clinical studies indicate that tea drinking may increase your resistance to the development of osteoporosis, according to Research Associate Dr. Jane Higdon of the Linus Pauling Institute. Tea consumption may help prevent heart attack and stroke, notes Dr. Higdon. English tea contains a type of polyphenol compound called catechins that at least partly confer its cardiovascular health benefits. Tea catechins improve blood vessel flexibility and function, which allows blood to flow unimpeded throughout your body. These polyphenols also lower the ability of blood platelets to form dangerous blood clots in arteries of your heart or brain. Additionally, tea catechins may lower the amount of oxidized cholesterol circulating in your blood, according to the North Dakota State University Extension Service. Drinking tea in place of unhealthy soda or other high-sugar drinks is a good way to work at improving your health. However, black teas such as English tea are relatively high in caffeine compared with green or oolong teas, according to the NCI. Potential adverse health effects of high caffeine intake include rapid heart rate, heart palpitations, insomnia, nervousness and gastrointestinal upsets. 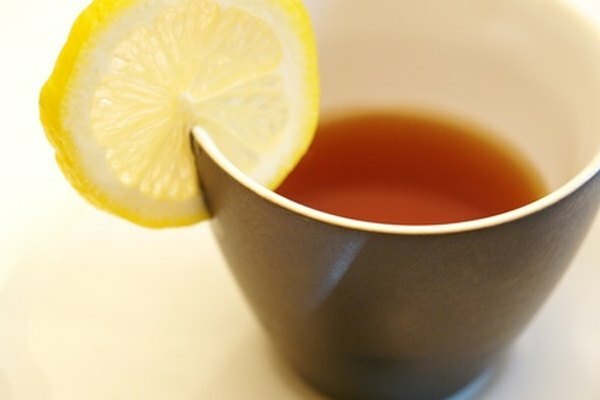 Black tea may also lower dietary iron bioavailability. Nevertheless, health experts suggest at least a couple of cups of tea daily to promote good health, according to the North Dakota State University Extension Service report.